Since the release of BookPsychic, LibraryThing’s first-of-its-kind recommendation service for library patrons, we’ve received a lot of feedback, and implemented four major changes. Authors you’ve read. Some reviewers found BookPsychic recommended too many books by authors they had already read. Others thanked us for a useful way to discover backlist titles by authors they loved. The issue is basic. While BookPsychic, like LibraryThing, tends to “recommend down”—from more popular to more obscure books by an author—it certainly does recommend books by authors you rate. Instead of establishing a new rule, like “no recommendations for authors you rate,” we decided to treat this as a display issue. Same-author recommendations should be there, but they should be clearly separated somehow. To implement this we came up with a recommendation section for “Recommendations by authors you have rated” (seen at right). So the high-volume Danielle Steel reader can stop dealing with so many books you already know about, but the teenager who recently finished The Lord of the Rings can discover The Silmarillion or The Children of Húrin. We also push same-author books back somewhat in the genre browsing. You’ll see them, but fewer of them. Search. BookPsychic was designed as a recommendation system integrated into your OPAC, not an OPAC itself. So the first version passed you back into the OPAC when you wanted to search. 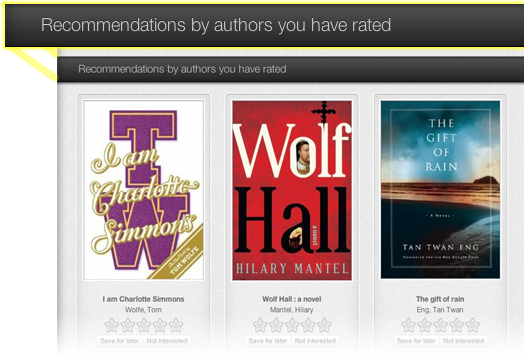 But some reviewers found this clunky, and wanted a quick way to search for books to rate. So we added a search box. It’s simple to use and keeps you in BookPsychic. You can rate items right from the results. Other authors. Together with the search box, we added a back-of-book button for “more by this author.” It’s a handy way to give Steel or Tolkien a dozen thumbs up. Coverage. BookPsychic’s coverage continues to improve, with most libraries seeing 55-75% of their ISBNs falling into one or more of its preset genres. A higher percent can be recommended, and everything can be rated. The system now also picks up non-ISBN items in your library collection, and we’ve added a new genre for “Art and Design.” We’re eager to develop more genres, as wanted. 29% of Americans 16 and older said they would be “very likely” to use such a service, with another 35% saying they would be “somewhat likely” to do so. 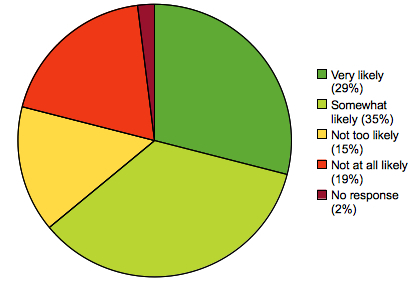 That’s 64% of patrons interested in a library service which suggested books, audiobooks and DVDs to them based on their own preferences. This shouldn’t be a surprise. It’s not just Amazon that learns what you like these days. Personal algorithmic recommendations drive dozens of major sites, from Netflix and Pandora to Pinterest, YouTube and Twitter. Patrons get this stuff. As chance would have it, we know of only one service that integrates with library holdings and catalogs, allowing library patrons to receive personalized recommendations—our own BookPsychic. Yes, there are a few in-catalog services that offer recommendations book-by-book—including our own LibraryThing for Libraries “Similar Books”—but BookPsychic is the only library service that learns what you like and adapts accordingly. What is BookPsychic? Launched in August, BookPsychic is an easy and fun personal recommender system for library patrons—like Netflix or Amazon, but all about what’s in and what’s popular at your library. As you rate books and DVDs, BookPsychic learns more and more about your tastes, and comes up with recommendation lists. And everything shown or recommended is available at your library. Simple “bookstore” genres, like “Recent fiction” and “History,” help you zero in on the books you want. In the text of the full report (p.61) the researchers noted that some librarians were hesitant to endorse a recommendation service of this type due to concerns about privacy. For patrons, BookPsychic is a completely optional and opt-in system, with stringent privacy protections governing any ratings you make within BookPsychic or any recommendations made to you. For more information on BookPsychic, see the announcement blog post, or come give it a try with the Portland Public Library. If you want to see what it can do in your library, we’d be happy to set you up with a simple no-commitment trial. Abby and Kate will be at ALA Midwinter in Seattle this week, so stop by Booth 1108 and chat with them about BookPsychic, or any of the other LibraryThing for Libraries enhancements. The Pew report is based on a survey of 2,252 Americans aged 16 and above taken between October 15 and November 10, 2012, with a mixture of cellphone and landline surveys. The margin of error is +/- 2.3%. For some more data related to this particular question within the survey, see page 61 of the full report.